Email marketing can be one of the most beneficial ways to keep an open line of communication with previous customers or clients. Advances in technology mean they can also be a huge resource for gaining potential customers as well! E-commerce sites are using email marketing to automatically target customers who begin to buy products but never actually complete the purchase, for instance. You wouldn’t leave a good friend’s house without some way to reach out to them later. Right? Therefore, why would you let customers walk into your store or visit your website without providing a way to contact them later? It can be an excellent way to up-sell them on products or remind them of other services you provide. While email marketing is a very important aspect of any marketing strategy, it’s only effective if done correctly. Here are some of the most common email marketing mistakes we see from emails we’ve received. The subject line is the first content from your email that customers or potential clients will see. And it very well could be the last. Your subject line will often determine if they actually open your email to view the rest of your content. It should be well thought out , use proper grammar & spelling, as well as reflect the actual content of the email. Nothing is more frustrating than reading an intriguing subject line and opening the email only to find that nothing in the email refers to it! This can be one of the most detrimental mistakes of your email marketing strategy. The vast majority of users will now open your email from a mobile device. 66% of all emails opened in the US were opened on a smartphone or tablet. If your design doesn’t load correctly or requires a lot of dragging and zooming they are likely to click right back out, letting your valuable content go without eye balls. A huge mistake we see is often using one, large image for your email contents. This is bad for many reasons. Should images not load in their email client, your entire message isn’t conveyed to the user. This method also doesn’t allow text and other elements to size themselves according to the screen and device. Images and other elements can have a huge impact on your email marketing, but must be used with caution and appropriately! If the first step is writing the content to send, the next step would be analyzing the results of said content. It’s important to ensure you’re not having a large influx of unsubscribers and to see if your content is resonating with your audience. A large number of unsubscribers is a pretty good sign that you should reconsider the frequency of emails being sent out or how you’re attaining your list. A low click-through rate can signal an issue with your call to action. You might try rewording it or moving it to a different section of your email design. Your open rate could indicate which types of subject lines your audience prefers. There is some action to be gleaned from almost every metric available to you. Use these to your advantage to improve the effectiveness of your strategy and see a higher return on your investment. This is a quick way to kill your open rate! Customers or potential clients, in particular, often find this cold, unwelcoming, and uninviting. It’s also very confusing. You’re attempting to open a line of communication with them, yet instantly shut it down. You should always send your emails from a domain that they can reply to and that someone checks frequently. If possible, send from a recognizable name. Even if the emails aren’t designed by yourself, if your name is the one customers would recognize that is who your emails should be sent from. 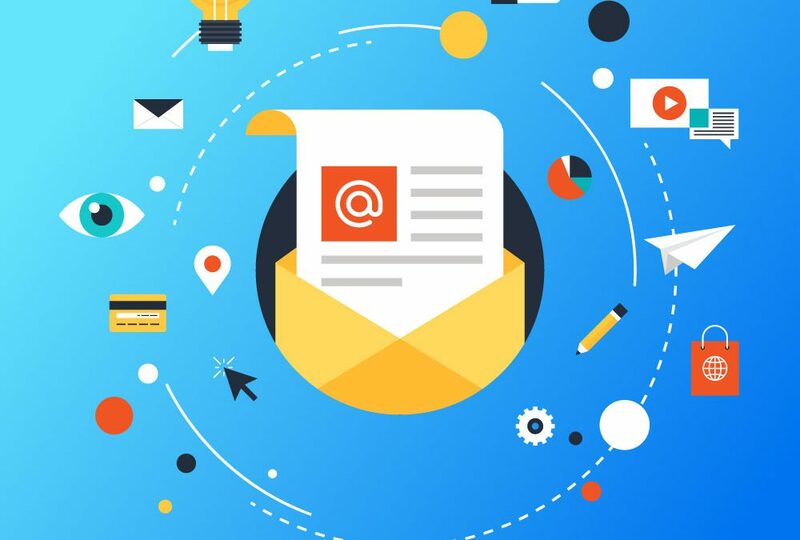 Ultimately, You should treat your email marketing as another way to create a conversation, showcasing your latest products or services while allowing questions from them to clear up any confusion or problems. Just segmenting your email list can have a huge impact on conversions! Your audience has different interests just like you or me and we now have the technology to be able to distribute targeted emails to people based on their interests and needs. This could be as simple as asking if they are male or female when they sign up so your clothing company only shows relevant products for them. Or this might include segmenting your email list by location to show pertinent products based on the current season. If your products or services don’t appeal to the user viewing the email, you may begin to lose them over time as they open your emails less and less frequently. You can have the best email campaign in the world but if there is no one to view it your efforts have been wasted. You already have plenty of resources around you to help build your email marketing list! Start by adding email addresses that you’ve collected for your current clients. If you’ve not been collecting emails for your clients, now is the time to start! You could add a sign on the front window of your store or post a sign up link on your social media accounts. (Be sure to take advantage of your personal social connections who might be interested in your products or services as well.) It’s also very important to have a sign up form on your website to catch the organic traffic that is sent there. Possibly the big mistake you can make is buying an email list! These people have no idea who you are and most email systems strongly dislike customers who upload large lists. Overall, slow, organic growth of your list will be the most beneficial to you and show the biggest return on your investment. This simple step can save you a lot of embarrassment later! Be sure to send the email to yourself first and view it on both a desktop computer and mobile device to make certain it looks professional and works as expected. Check the links to ensure they take users where they should. Be sure to include pertinent links as well! If you are asking users to buy tickets for an event, be sure to include a link where they can buy tickets. Every email should have some ultimate goal for the user, or a call-to-action. Testing your emails can guarantee that your business looks professional, remains authoritative, and calls your customers to take an action that will can help increase your ROI.